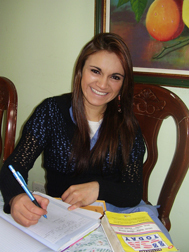 Yuli is a young girl who belongs to a youth community at SOS Children's Village Bogotá. She is someone who has had to mature abruptly because of the way her life changed and especially because she made some personal decisions which turned out to be wrong. Today, after having left the village for some time, she feels grateful to the organization because she knows that, in spite of the bad decisions that she had taken in the past, SOS Children's Villages has always remained there by her side, offering her the affection and support that any young person deserves. "I was born in 1990. My mother's name was Ruby; she died a long time ago. I never met my father. My mother was a great woman, a good mother and a friend who loved us greatly and who gave us everything to turn us into good people. I have six siblings whom I love very much, not only because they are my family but because we had to share many difficult moments together. "My mother died when we were still very small. This affected us quite a lot because we didn't have anyone else, neither family, nor friends to support us. After receiving help from social welfare for some time, we arrived at what was to be our new family: the SOS Children's Village Bogotá. Here, we started a new life: friends, a family, and an SOS mother. This was where we found many people willing to do their very best to improve our life in any respect. "At present, I am enjoying a wonderful experience which has motivated me to share part of my life story. I am now living with six other girls that are also getting ready to lead an independent life. SOS Children's Villages has given me the opportunity to study oral health at the International Polytechnic Institute. I am doing my first semester and my biggest dream is to become a professional, so that I can offer better quality of life to myself and to my siblings." Yuli is in the prime of her life and she lives it to the full, motivated by her wishes and dreams. As she puts it: "God doesn't exist for those whose dreams are not important," and because of this she assures: "I thank God and all the people who made my dreams come true." SOS Children's Villages continues to be the best option for hundreds of children and young people who, like Yuli, didn't have anybody to support them when in need.